When people notice the presence of a single ant in their kitchen for the first time they are not unduly alarmed. However, when that turns into two, three, four and more then it becomes a bit more worrying. Anyone who has experience with ants know that they can quickly become a serious problem. They can contaminate the food, damage the fabric of your kitchen and generally become a real nuisance. 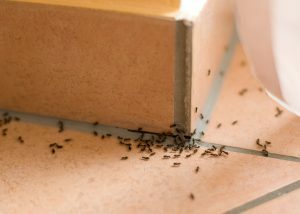 Even though the elimination of ants may seem a difficult activity, the fact is that there are some repellent options that are simple and effective. To start with, you will need to monitor their movement. They have a path which they tend to follow so this shouldn’t be very difficult. After a while, you will be able to identify the entry points used by ants. Once you have done this, you will need to block these points to stop their entry and then ideally look for their nest and use an established ant killing spray/chemicals. The presence of a single ant in your home is just a sign that more of them will follow. They are social insects and they don’t live alone. They also use a trail so if you have eliminated them, it is a good idea to use a mop to cleanse the trail thoroughly, so other ants can’t use the same trail again. They have a strong sense of smell and they use it to travel. If you just want to repel other ants from coming to your kitchen, you can use soapy water for this purpose. Take one capful of water and liquid hand soap and pour it in a spray bottle. Shake to create a mixture and spray the solution directly on the ants whenever you notice some of them. In addition, you can also use a mixture of four cups of water and one cup of lemon juice to wipe the affected areas and possible entry points. The aroma and scent will make ants stay away from these areas. Some people also use herbs and spices to protect their kitchen from ants. Garlic, chili peppers, black pepper, mint leaves and cayenne pepper have proven to be efficient natural repellents. Some ant infestations are more difficult to deal with and the nests can be hard to locate. If you’re experiencing an ant infestation and all your efforts have failed, then give us a call. We have dealt with hundreds of ant infestations and we are confident that we can help you.